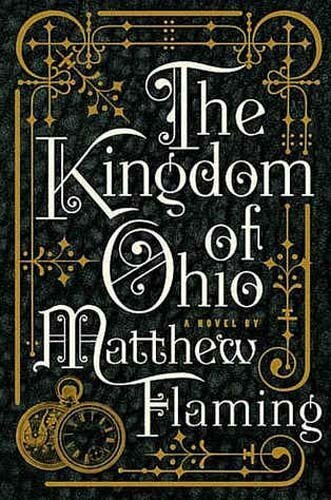 What it’s about: I have been remiss in writing a review of The Kingdom of Ohio, which I finished several weeks ago, mostly because I don’t want to have to tell you how much I disliked it. I know, I know, it’s shocking! This book has been quite popular, frequently exhibited on tables and a common recommendation for book clubs (one of the reasons mine chose it). I thought I’d like it, but the book broke a few of my cardinal rules, leaving me merely frustrated rather than intrigued. But before we get to the problems, let me at least give you the basics so you can decide for yourself. Peter Force relocates to New York City at the turn of the century and takes a job helping to drill the first subway tunnels. A poor newcomer to the city, Peter finds a room in a flophouse and befriends his fellow workers, but the city only really seems to come alive for him when a chance encounter introduces him to Cheri-Anne Toledo, a woman who believes she has traveled seven years into the future. Cheri-Anne is the last of the House of Toledo, a small independent kingdom that few know has existed in the center of Ohio since before the Revolutionary War. She insists that she and eccentric inventor Nikola Tesla were working on a time-travel device and that an attack on her home caused the machine to activate and catapult her to a future New York City. Peter believes Cheri-Anne to be insane, but after meetings with Albert Einstein and fiscal baron J. P. Morgan, he starts to wonder if there might be some truth to Cheri-Anne’s wild tale. My first issue with the book comes from what I would call wasted potential. While the title of the book may be The Kingdom of Ohio, the kingdom itself plays a bit part. It’s merely in Cheri-Anne’s backstory and we get only some “historical” excerpts and a chapter that seems ripped from a dry history book. I would have gladly read an entire novel on the struggle to found the Kingdom of Ohio, the secret royal family that existed within the United States, the mechanations of the government to take control of the tiny rebellious state. Was it real? Or was all that “history” invented for the book? I still have no idea! But it hardly matters because the story of the Kingdom is buried and told without personality or character. Speaking of character, there were two in this book with great potential about whom I would have gladly read an entire novel: namely, Tesla and Einstein. But these colorful characters in American history seem merely props in a time travel romance. With all the historical potential here–Ohio, Tesla, Einstein, New York, J. P. Morgan, the subway, the Brooklyn Bridge–why was the focus on a romance between two watery nobodies and a time travel device clumsily laid over more interesting material? My other minor problem was that the book happens to be framed by one of my greatest pet peeves–a narrator who writes about writing the book we now read. I just hate this. In rare cases, it can be done well, but more often than not the effect is to pull me out of the story and disconnect me from the narrative. When one of the first paragraphs in the book started off something like “getting the first sentence down was the difficult part” or “I wondered how to best capture the story,” I knew I was in trouble. I recognize this voice of the fictional narrator as the voice of our author as well. It only served to disconnect me from an already scattered story with too many potential directions. I only wish the focus hadn’t been romance and time travel, what I consider to have been the weakest points in The Kingdom of Ohio‘s arsenal. Would I recommend? As you probably might guess, no. The Kingdom of Ohio had a lot of great source material, but the execution was lacking.